Three Rings for the Elven-kings under the sky, Seven for the Dwarf-lords in their halls of stone, Nine for Mortal Men doomed to die, One for the Dark Lord on his dark throne In the land of Mordor where the Shadows lie. One Ring to rule them all. One ring to find them. One Ring to bring them all and in the darkness bind them. In the land of Mordor where the Shadows lie. 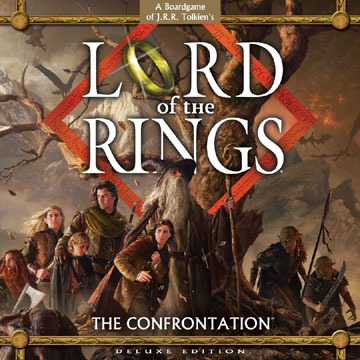 This Deluxe Edition of Reiner Kniziaâ€™s acclaimed The Lord of the Rings: The Confrontation combines an ultimately crafted edition of the popular game with an exciting expansion for this award-winning game. The Confrontation is a two-player board game in which players take control of the forces of Sauron, seeking to find their masterâ€™s ring, or the forces of the free peoples of Middle Earth seeking to destroy Sauron's ring in the fires of Mount Doom. One of the most acclaimed board games of recent years, The Confrontation allows players to control many of the famous characters of Tolkien's famous trilogy, while playing an intense 30-minute game that is a wonderful combination of bluffing and strategy. The Confrontation is designed by renowned game designer Reiner Knizia, and considered among his best works. Deluxe Confrontation gives the game a new and larger gameboard, larger sculpted plastic stands, and completely new artwork and graphic design.The game includes 18 entirely new characters in addition to the classic characters found in the original. The new characters allow players to play an entirely new game, or mix the new and the old characters for an entirely different game experience. Very cool game. A must for all Lord of the Rings fans, fans of Stratego, or those in need of a 2 player game. LOTR Confrtontation takes Stratego to new levels with great characters, nice board, and interesting strategical possibilities.